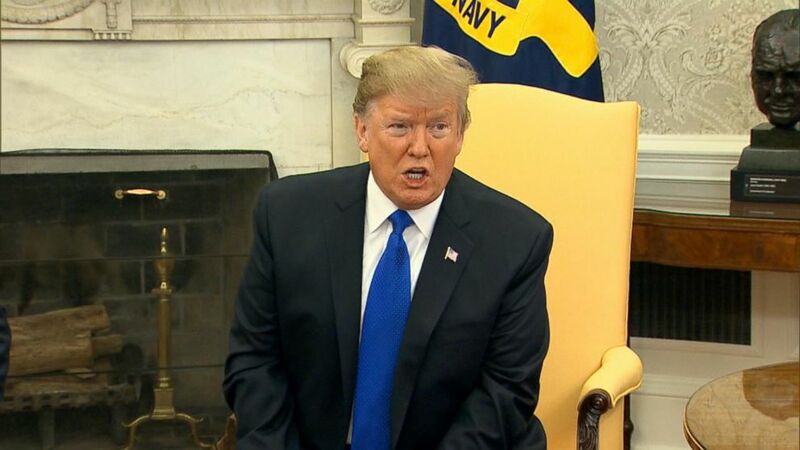 Now, to president trump, and what he said today on the deal from Democrat and Republican ne goesh yeah or thes when it comes to his and ins for a border wall. Will the president sign it with now another shutdown looming? ABC’s Cecilia Vega asking the president today, is he now willing to accept less for the wall than what congress had offered him before the first shutdown? Reporter: President trump signaling today he could soon sign a compromise bill to keep the government open. We haven’t gotten it yet. We’ll be getting it, we’ll be looking for landmines, because you could have that, you know. It’s been known to happen before to people. I don’t want to see a shutdown. A shutdown would be a terrible thing. Reporter: Lawmakers are scrambling to finalize legislation that gives more than $1.3 billion for a stretch of barrier along the southern border. That’s hundreds of millions less than what the president rejected in December, triggering the longest shutdown in history. So today, I asked him — Mr. President, are you willing to take less money this time than what was on the table just a few months ago? Actually, it will be, regardless of what I do, you know, we already have, as you know, a lot of money. We are building existing wall with existing funds. Reporter: Despite what the president says, no new wall has actually been built yet. And while the compromise would pay for 55 miles of steel barriers like these, it does not cover the concrete wall the president campaigned on. Many of the president’s conservative allies are slamming the deal. Today, house speaker Nancy Pelosi was asked if it’s a win for her party. Well, it’s not a question of win. It’s a win for the American people. It’s a compromise. Reporter: The president’s options now? Declaring a national emergency and using money already set aside for the Pentagon, treasury department and disaster relief programs, moves that are sure to be challenged in court. With the wall, they want to be stingy. But we have options that most people don’t really understand. All right, so, let’s get to Cecilia Vega. And Cecilia, there is word tonight, you were telling us about a possible holdup on this bill, and it involves to give back pay to government contractors. We know government workers have now been paid for that lost time, but contractors are still waiting? Reporter: Yeah, David. And sources tell us that the president could reject this deal if bay pack is included, because the administration believes this really could become an expensive and logistical mess. They don’t know exactly how many contract workers were impacted. We’re talking about people like security guards and janitors, people who really help keep this government running, David. Cecilia Vega on this again tonight.